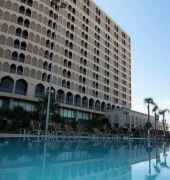 The Hilton Alger is a five star oceanfront property located just within 15 minutes journey from central Algiers, adjacent to Algiers International Exhibition Center. Accommodations feature air conditioning, work desk with adjustable lamp, tea and coffee making facilities, mini bar, satellite TV, safety deposit box, high speed internet access, hair dryer and bathroom with refreshing bath amenities. Rooms are also equipped with private balcony offering various views. 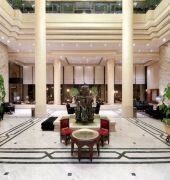 The hotel is home to a number of restaurants that serves traditional Algerian cuisines, French specialties and international dishes in diverse ambiances. 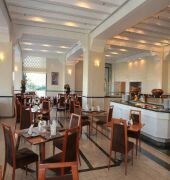 Additionally, guests can also enjoy drinks and light snacks at the bar or refreshing beverages at the lounge. 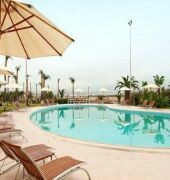 Leisure facilities include an outdoor swimming pool, gymnasium, tennis court, steam room and sauna. Complimentary shuttle service is provided from Houari Boumediene Airport which is approximately 15 minutes drive away from the hotel.